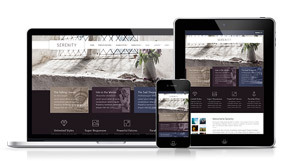 Our Joomla template release for October is the elegant Serenity template. A beautiful all-in-one solution for any business or personal site boasting a host of great features. This template will ensure you have everything you need to get your website online. They say that beauty is in the detail and we can promise you 'Serenity' is all about the finer details! Where to start... firstly Serenity comes bundled with a whopping 8 module extensions. These modules allow you a full tool set to meet all possible requirements. Among these we have included a super easy to use Pricing Table module which will allow you to showcase your products/services with just a few clicks. A new Thumbs Gallery module with improved mobile support. And finally our News module which offers new features over the Joomla default 'Latest News' module with image and caption support. Carefully crafted, Serenity is built on a perfectly structured and functional layout ensuring your content will always look it's best. Fully responsive with plenty of related options allowing you extended control of how your content is viewed no matter what the device. Serenity heralds the return of our much loved 'Module Style Overrides'. Available within the template parameters, this feature allows you total control of each individual module. Settings are included to control module background images, border, content color, padding and margin. No more playing around with custom CSS to get your modules looking exactly as you wish. A recent addition to our templates is a greatly extended collection of features to the main navigation. These features include multi column dropdowns, menu item sub titles and a megamenu dropdown option allowing you to load any module directly in to your navigation dropdown. All the usual features are there including multiple styling and color options, total layout control of the 60+ module positions and a host of typography options. So check out Serenity today and prepare to be astonished by what you can create!